Two relationship movies open this week–one of them about the Obamas. Also Preston Sturges, Ray Harryhausen, Alfred Hitchcock, and a Mexican film festival. 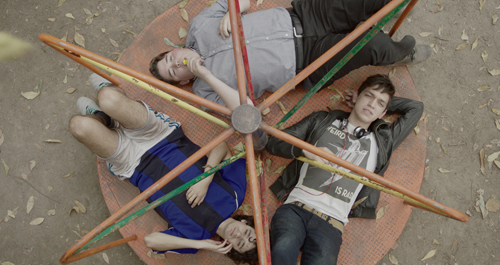 The Hola Mexico Film Festival opens tonight and runs through Sunday, screening ten Mexican films over the weekend. Over a weekend getaway, a group of friends try to convince an unhappily-married couple to divorce. But they can’t manage that task without their own relationship problems bubbling up. What do you expect? The person who planned this “marriage intervention” is a supremely mess-up alcoholic. I’m not sure if I should call this a very serious comedy or a very funny drama. Either way, it’s entertaining and touching. Read my full review. Yet another variation on Before Sunrise. Two attractive people who barely know each other walk through a city, talking, doing fun and meaningful things, and getting to know each other. Only this time, the couple are a young Barak Obama and Michelle Robinson. He thinks it’s a date; she insists not. The movie is very upbeat (the opening made me think it was a commercial), kind of sweet, but unexceptional. Read my full review. Finding a keychain in a huge pile of leaves is a daunting task, especially if you’re not sure which huge pile is the right one. The task is near impossible if you’re a teenage boy getting help from two other teenage boys, all struggling with ranging hormones and short attention spans. Alejandro Iglesias Mendizábal and his collaborators turn this everyday annoyance into a touching and frequently hilarious comedy. The laughs become rare near the end, but the story holds up without them. Part of the Hola Mexico Film Festival. No one else wrote and directed screwball comedies like Preston Sturges, and if this one doesn’t quite come up to the brilliant level of The Lady Eve, it’s still a great time at the movies. It’s not just the absurdity of casting singer Rudy Vallee as the millionaire rival ready to win Claudette Colbert from husband Joel McCrea, it’s also the Weenie King, the Ale and Quail Club, Toto, and the most ridiculous happy ending ever filmed. On a double bill with The Philadelphia Story. Alfred Hitchcock’s second film and first thriller, The Lodger feels like the master in embryo. The plot and the atmosphere set up themes he would use again and again, but this first time, he doesn’t quite get it right. For instance, the protagonist just might be the murderer–a piece of mystery that robs the film of much of its potential suspense. It’s all made worse by Ivor Novello’s anemic and bizarre performance. But if you love Hitchcock, you have to see The Lodger for its historical importance. Accompanied by Judith Rosenberg on piano. Part of the series Hitchcock/Truffaut. Pulp Fiction, Castro, Friday, on a double bill with Repo Man.